California is a major destination wedding state. It’s obvious, right? I happen to enjoy the blessed life living in year-round sunshine. Yes, we do complain here in SoCal (as we locals call it) when temperatures dip into the 50’s or when the humidity is greater than 15 percent. We are definitely thin-blooded folks. But you would be too if you wake up most days to temperatures in a very comfortable zone. 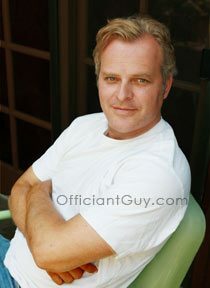 I officiate many destination weddings for couples who come from all over the United States and from all over the world. One of the major reasons couples like to get married here in California is that we have a unique marriage license called a California Confidential Marriage License. It’s a private marriage license that doesn’t allow anyone else, without a court order, have access to the marriage license or the personal information that appears on the marriage license. I am authorized to issue your confidential marriage license, with the added benefit that it will permit you to avoid the bureaucratic headache of standing in line at one of the few County Clerk’s offices. I take care of all the paperwork for your license to wed. And for those couples from one of the many countries that require it, I can deal with the necessary governmental authorities to obtain an Apostille for you. I officiate beach weddings in Southern California pretty much every week. Most of the destination weddings that I perform take place on a beach, and there are many beaches in Southern California to choose from. Each beach in the LA area has its own unique vibe. Please call me to ask for advice on a beach wedding in LA County or Orange County and even further out in Ventura County, San Diego County and Santa Barbara County…I’ve officiated in all of these beaches in Southern California and know most like the back of my hand. Some of the Southern California wedding destinations can be very different and interesting. For a destination wedding in LA you can do a guerrilla wedding (that’s code for weddings on the sly where you might get caught and booted out) at a park, or the Batman cave, or some particular movie location that’s a favorite (I’m getting calls lately from couples who want to be married at a variety of La La Land movie locations). Los Angeles has many iconic locations that can serve as a backdrop to your LA destination wedding. You could be married at the Griffith Park Observatory, or with the Hollywood sign as your backdrop, or in front of the Staples Center or the among the vintage street lights in front of the Los Angeles Museum of Contemporary Art, on a bluff overlooking the ocean, in front of the old Pasadena Courthouse, at MacArthur Park or Elysian Park, in the L.A. Arts District, on Hollywood Boulevard, in one of several beautiful and historic gardens, in or on the Queen Mary, with the one of the many SoCal marinas in the background, at the LA Airport, in front of a marijuana dispensary, on or beneath one of many piers, in old Hollywood, Silverlake, Downtown Los Angeles and almost any place else you would like. In Orange County, if you’re an Angels fan, as I have been since birth, you can try to arrange a wedding at Angels Stadium (it’s not easy). Or you can get married at Bowers Museum. Or you can just get married on the balcony of your hotel room.And of course, Disneyland weddings are the rage, especially Disneyland destination weddings. Click here to see all the types of wedding ceremonies I have performed and here to see the different unique wedding venues where I have worked. I was the officiant for a Disneyland destination wedding. 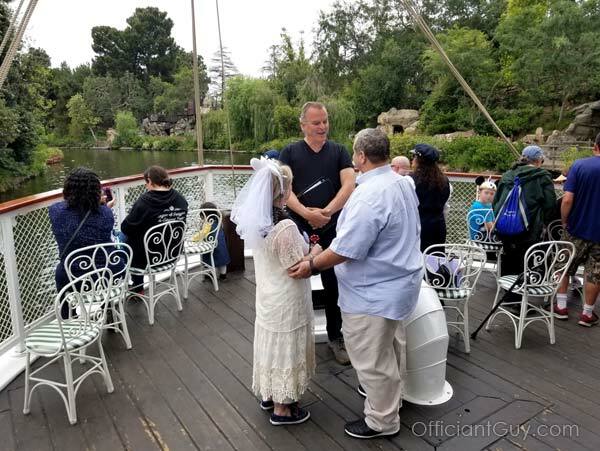 This groom worked on the Mark Twain for years and so getting married at Disneyland seemed like the thing to do. I’ve married couples on the Ferris wheel at the Santa Monica pier. 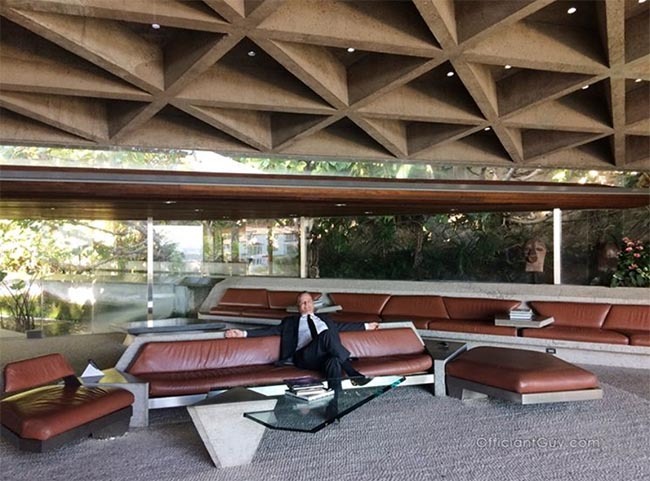 Some lucky couples have “ins” to certain iconic buildings such as the one I did at Jackie Treehorn’s house (from the Big Lebowski), which by the way, is nowhere near the beach, unlike the movie. Inside the fictitious Jackie Treehorn house from the Big Lebowski movie. I was very happy to be the officiant for the couple who got married here. But if you are eloping in LA, there are countless possibilities. I’ve married couples in their hotel rooms, in hot tubs, at Starbucks, on rooftops, and while walking across Sunset in front of the Whisky a Go Go. Whatever you have in mind is almost certainly possible. It all really depends on you and your personalities, obsessions and shared passions. 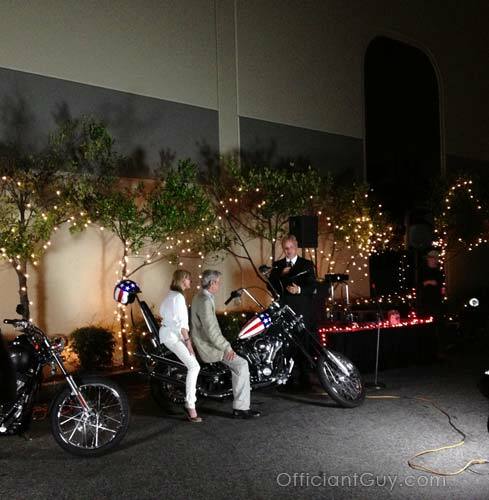 This couple came from England to ride their motorcycles cross country and then end with a destination wedding in LA. Southern California is so vast and each area or county has a huge variety of wedding venues. I have married couples in every county in SoCal. In addition to Los Angeles and Orange Counties, I also officiate weddings in Riverside, San Bernardino, Ventura, Santa Barbara and San Diego Counties. And I can issue a marriage license to you in any county. What’s great about destination weddings is that you leave your hometown single, have a private wedding that is fun and carefree, have a honeymoon and return married ready to celebrate with your family. Big weddings can be very stressful, and if you’re inclined to be married in a way that is more personal and stress-free, then maybe a destination wedding in Los Angeles, or nearby is in your cards. Give me a call today at (310) 882-5039 and I can help make some suggestions on where you and your fiance can marry in Southern California. The two of you may easily enjoy the marriage ceremony that is tailor-made for you. Chris Robinson is a Southern California wedding minister. Chris has been performing nuptials and issuing wedding licenses for many years for couples in love. Officiant Guy would be able to undoubtedly become your celebrant for any type of wedding ceremony from a spiritual wedding to a secular wedding together with possible additions from coin ceremonies to unity candle weddings. Once you are arranging to tie the knot in the periphery of LA give the recommended wedding minister in Southern California a phone call at (310) 882-5039 or (562) 547-3255 or contact him here.